Equipped with advanced IGBT control module and circuit design, offer stable arc and easy arc strike. 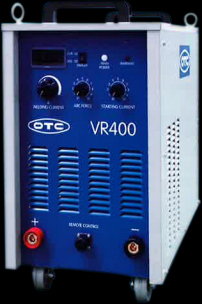 Due to perfect constant current characteristics, welding current is always kept constant no matter conditions such as hand position change, input voltage change, surrounding temperature change or cable length change. Suitable for wide application such as oil and gas, pressure tank, construction, various factory work and repair work. Remote control box (optional accessory) for easy setting of welding condition. Features input over-voltage protection circuit, input low voltage protection circuit and input lack-phase protection circuit. In accordance with DAIHEN�s policy to make continuing improvements, design and/or specification are subject to change without notice and without any obligation on the part of manufacturer.